Back in June 2017, we wrote that if one had to follow just one macro indicator that impacts virtually every aspect of the global economy, that would be the Chinese credit impulse. Not surprisingly, the article was titled "Why The (Collapsing) Credit Impulse Is All That Matters." Today, almost a year and a half later, the world is once again on the verge of a recession, with China - whose recent economic data has been on the verge of disaster - closely watched as the spark that could light the next global economic and financial conflagration. 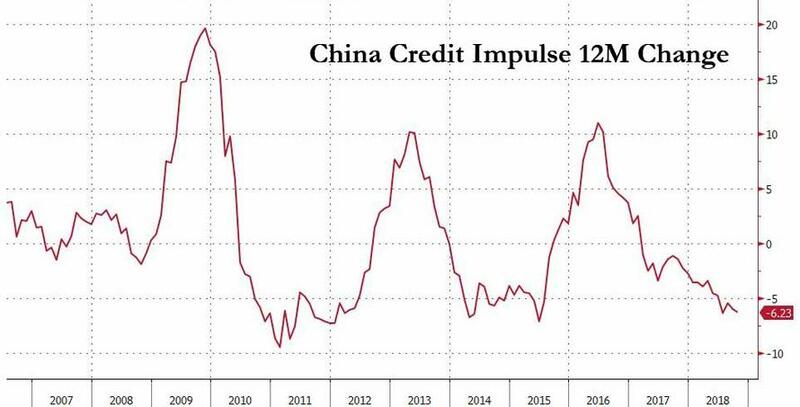 And not surprisingly, it is again all about the Chinese credit impulse, which - it should come as no surprise - has dropped to just shy of a fresh post-crisis low (note how it was China's record credit impulse burst in 2009 that dragged the world out of a global recession). So with attention focusing on China, Nomura's Ting Lu’s this morning reiterates his view on the sequencing of China's economic data, and expects the front-loading of exports to continue over the 90-day truce period, which will help support production in December however this benefit will be somewhat offset by weakening external demand, and thereafter into 1H19 (esp Q2), data will show significant slowdown, as the pull-forward around the tariff front-loading will fade in conjunction with the negative impacts of the cooling housing sector and the overall credit down-cycle. As a result, Ting believes it will be in 2Q19 when Beijing is forced to escalate policy easing/stimulus measures as the data negativity hits “breaking point," with RRR cuts, infrastructure spending, VaT cuts, RMB depreciation and deregulation in large city property sectors, which will eventually drive a bottoming-out in the data thereafter. How does all of this feed into China's credit impulse? 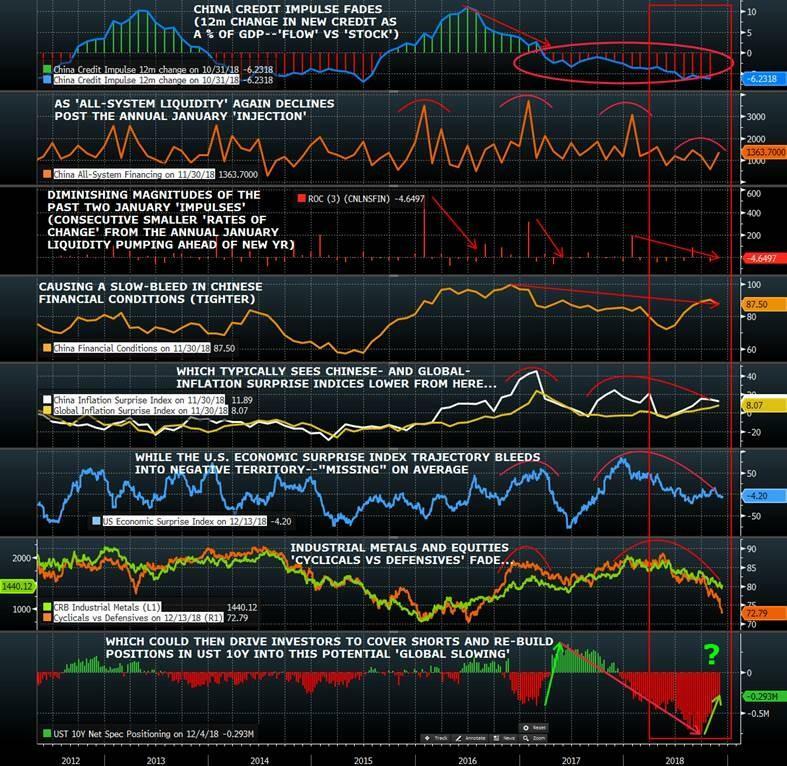 Well, as Charlie McElligott writes this morning, echoing our favorite macro theme, the Chinese credit impulse, with its negative "flow", continues to dictate thematic macro themes such as: weaker inflation, weaker growth, the collapsing "cyclicals/defensives" ratio, fading industrial metals and, most importantly, forcing speculative positioning in 10Y Treasuries to cover their record short. All this is shown in the thematic flow chart below, which begins (and ends) with the rate of change in China's credit impulse.